Montserrat, a British Overseas Territory located in the Leeward Islands in the Caribbean Sea has a total land area of 39 square miles and a population of around 4650. 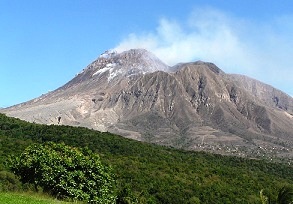 Montserrat has an active volcano whose eruption began in 1995 – it is on a much reduced scale at present. Despite the volcanic activity, more than half of Montserrat remains lush and green and is home to a wide variety of rare plants and animals. Its economy is based on sugar, rum, arrowroot and cotton and the operating budget provided by UK and through various taxes. The best time to visit Monterrat is from November through December. The major activities visitors engage in are volcano watching, birding, diving, snorkeling, hiking, and turtle watching. The cuisine is a blend of English, Spanish, French, African, Indian, and Caribbean styles. Locals generally prefer fish with local bread on the side. Montserrat and Montserratians 978-0973695007 $30 Photo Exploration of Montserrat by award-winning photographer Igor Kravtchenko. It depicts the history, culture, traditions and development after volcanic eruption in 1995 through thumbnail photos and stories. 96 pages. The first stamps of Montserrat were a set of two stamps released in 1876 which were overprints on stamps of Antigua depicting Queen Victoria (QV). The set (Scott #1 to #2) catalogs for around $100 mint and around $80 used. Some varieties such as vertical, diagonal half/one-third used on cover fetch into the thousands. Montserrat came under United Kingdom following the Treaty of Paris in 1782. It was administered as the Federal Colony of the Leeward Islands between 1871 and 1958. A few other QV key types and overprints on Antiguan issues followed during the period from 1880 to 1885. Stamps of Leeward Islands were used between 1886 and 1903. From 1903 to 1956, stamps of Leeward Islands and Montserrat were both used. Montserrat became an independent colony in 1956. Montserrat released a set of ten stamps in 1903 showing two themes: Symbol of the Colony and Portrait of King Edward VII. The set (Scott #12 to #21) catalogs for around $200 mint and around double that for used. This set was followed by the same set using a different watermark on chalky paper between 1904 and 1908. That set (Scott #22 to #31) is also sought after and catalogs for around $250 mint and around $300 used. Used variety of the same set (Scott #31A to #41) released between 1908 and 1913 is the most valuable set in the series cataloging as high as $450. A set of ten stamps released on April 18, 1932 to mark the three-hundredth anniversary of the colonization of Montserrat. The set (Scott #75 to #84) catalogs for around $325 MNH and around $440 used. The design shows a view of New Plymouth, harbor, and head portrait of King George V (KGV). Plymouth is the historic capital of Montserrat, but an eruption in the previously dormant Soufriere Hills Volcano in 1995 resulted in the destruction of Plymouth. The center of government is temporarily at Brades. Two-thirds of the Island’s population fled abroad following the eruption – the people of Montserrat were granted full residency rights in the UK in 1998 and citizenship in 2002. A long set of fourteen stamps released between 1970 and 1974 released in the Birds theme. The set (Scott #231 to #243A) catalogs for around $55 MNH and around $45 used. The designs show red-footed booby, killy hawk, frigate bird, white egret, brown pelican, bananaquilt, common ani, tropic bird, Montserrat oriole, greenthroated carib, Antillean crested hummingbird, little blue heron, purple-throated carib, and forest thrush. The same set released between 1972 and 1974 (Scott #231a to #239a) with the watermarks oriented in the opposite direction catalogs for around half the value of the original set. Other sets of Montserrat in the Birds theme include the Audubon Birth Bicentenary set of 1985 (Scott #580 to #583) that catalogs for around $2, the Marine Birds set of 1988 (Scott #667 to #671) that catalogs for around $20, etc. A set of four stamps released on February 2, 1981 in the Fish theme. The set (Scott #441 to #444) catalogs for around $5 MNH and around $3 for used. The designs show spadefish, tropical checkered skipper, large orange sulphur, and monarch. A Sheet of nine stamps and a souvenir sheet released on August 6, 1998 showing various portraits of Jerry Garcia, the Grateful Dead musician. The set (Scott #955a-i and #956) catalogs for around $15 MNH or used. Montserrat was popular with many musicians who preferred recording in its serene setting. A branch of George Martin’s AIR studios was based in Montserrat between 1979 and 1989. Montserrat has released a couple of other sets showing Jerry Garcia (Scott #914 to #915 and #970 to #983) and other sets featuring musicians (Elvis Presley – Scott #923 to #926, Bob Marley – Scott #954a-h, etc) over the years. A long set of sixteen stamps released on October 10, 2001 in the Fruits theme. The set (Scott #1041 to #1056) catalogs for around $30 MNH or used. The designs show West Indian cherries, mammee apples, limes, grapefruits, orange, passion fruit, bananas, papayas, pomegranates, guavas, mangos, sugar apple, cashews, sour-sops, watermelon, and pineapple. Montserrat uses the East Caribbean States Coinage and before that used the currency of the British Caribbean Territories. Certain Commemorative Issues primarily for the numismatic market has also been issued over the years. They are not that collectible yet. Cookbooks, handicrafts and local foods are the typical souvenirs of the place. Art $10 and up Vintage posters and maps start around $10. Canvas transfers of original works start around $100. Miscellaneous Collectibles $10 and up Vintage historical photo prints and local scenes prints start around $10. How to ace kindergarten screening (assessment test) at private schools? Our Fannie Mae (FNM) Investment – A Case Of Escaping With Minor Wounds! Teach your kids Piano with learn piano online for free – well, almost!! Flexible Spending Accounts (FSA) – Great Benefit with a few caveats! Amazon.com Customer Service – Jeff Bezos backtracks on 30-day price guarantee policy! FEIT Electric Energy Saving Bulbs – Consistently Low Quality! OPEN Event From American Express and SCORE – A Free Resource For Small Businesses! Solar Green Power – Should you install a Photo Voltaic (PV) module in your house? CFL light bulb humming or Digital Clock running fast – household alert! The content in this blog should not be taken as professional advice. We do not provide professional advice.